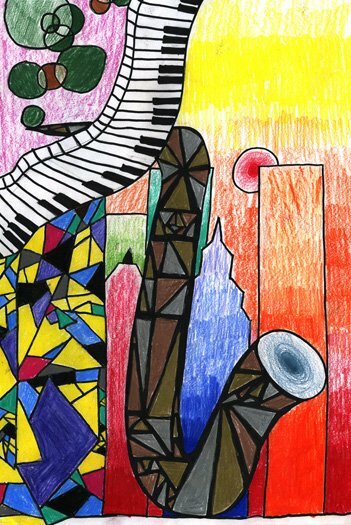 Berkshires Jazz, Inc. observed national Jazz Appreciation Month with a free performance at Baba Louie’s on April 25, plus the month-long exhibition of this year’s entries in the Student Art Contest at Pittsfield City Hall. The performance, which was sponsored by The Berkshire Eagle, introduced Faux Real, a quintet of next-generation musicians from Williams College and the Berkshires. They include Scott Daniel, violin; Max Dietrich, reeds; Jack Schweighauser, guitar; Mitch Zimmer, bass; and Gabe Morosky, the leader, on drums. The group’s repertoire ranges from Clifford Brown to Herbie Hancock, as well as original arrangements inspired by contemporary popular music. With both an original approach and respect for the jazz tradition, Faux Real represents an important aspect of creativity: they have the enthusiasm of students and yet the insights of the professional musicians. The audience of mature jazz fans and the younger, new followers enjoyed the evening. A tip of the hat to Kris Allen of Williams College for helping to make it happen. Also associated with our Jazz Appreciation Month activities, Berkshires Jazz hosts an annual student art contest. More than 100 student artists from Pittsfield and Taconic High Schools, as well as St. Joseph’s and Miss Hall’s, participated in this seventh annual contest, which was conceived by Art Niedeck, chairman of our Education Committee, as a way to engage more of the student community in cross-genre creative activity. This year’s Student Art Contest judges were painters Scott Taylor, Diane Firtell, and Julio Granda. The three winning entries were from Taylor Turner (P.H.S. senior), Max Whalen (P.H.S. freshman), and Anita Curtin (St. Joseph’s junior). 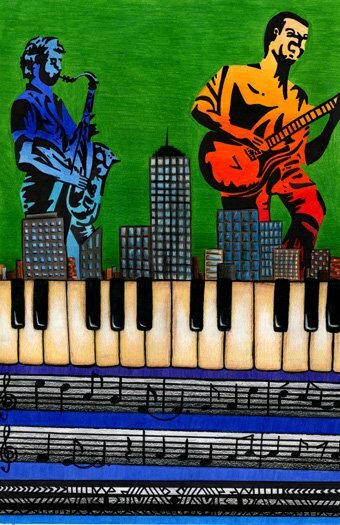 One of these will become the graphic symbol of the 11th annual Pittsfield CityJazz Festival in October. Related articles: Berkshire Eagle; iBerkshires.com. 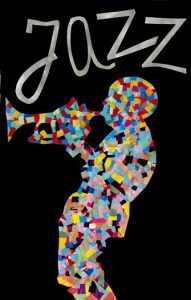 Every April is Jazz Appreciation Month, a national program started by the Smithsonian Institution in 2002 and recognized by Congress in 2003. Its purpose is to celebrate jazz, the country’s indigenous art form, often referred to as “America’s classical music.” It’s no coincidence that the Smithsonian chose April, the month of Duke Ellington’s birthday, to celebrate our cultural gift to the world. That appellation sums-up the attitude of the friends, family, and listeners to Reney’s long-standing, 5-night-a-week radio program, Jazz à la Mode. The program celebrated its 30th anniversary on Nov. 16, when 230 guests assembled in the cavernous digs of the music school, which is located in a former bank in the heart of downtown. Jazz à la Mode has been a staple of WFCR-FM’s offerings –and Reney its only host– since the station’s inception of jazz programming in 1984. The NPR affiliate, which operates under the aegis of New England Public Radio, recently relocated from the environs of Reney’s alma mater, the University of Massachusetts in Amherst, to become part of the downtown Springfield scene. The station’s signal is carried by about five repeaters in western New England and, for many, represents the only jazz within listening range. Reney got his start in broadcasting with seven years on a community radio station in his native Worcester. 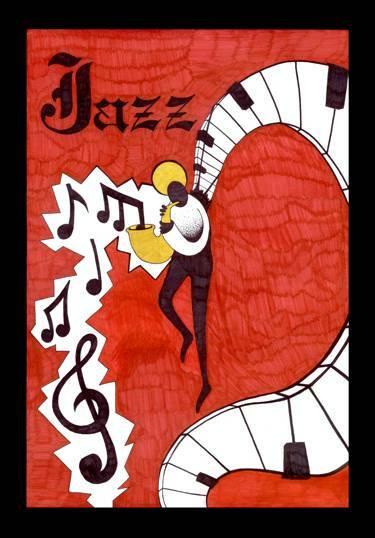 He has carried a torch for jazz since he would sneak-in to jazz joints when he was too young to be admitted legally. That sort of passion and dedication, plus his natural curiosity, mellow voice and articulate speaking mannerisms, made him a natural for radio. Seeking to satisfy his passion for the music, he eschewed an expected career in the family business of civil engineering, surveying the jazz scene instead of highways, golf courses, and landscapes. Reney’s 3-hour show is believed to be the only 5-night-a-week jazz radio program in New England, and is one of the longest-standing full-time jazz programs in the country. He credits NEPR CEO and General Manager Martin Miller for “maintaining a vision of public radio as a community service” for western New England. WFCR’s programming day includes NPR news, plus local and syndicated classical music and locally produced jazz. In addition to Reney’s program, his weekend colleague Kari Njiiri has also been part of the scene since 1984. To celebrate the show’s 30th anniversary, a bevy of local and regionally-based jazz musicians honored Reney, and by extension the station itself, with some 90+ minutes of planned and improvised performances. They included Paul Arslanian, piano and music director; Khalif Neville, piano; Steve Davis, trombone; Charles Neville and Grant Stewart, tenor saxophones; Jay Hoggard, vibraphone; Nat Reeves, Avery Sharpe, and George Kaye, bass; Cicci Santucci and Reney’s broadcasting colleague Peter Sokolowski, trumpet/flugelhorn; and Jon Fisher, Claire Arenius, and Billy Arnold, drums. Jim Argiro (piano) and Jason Schwartz (bass) played the opening reception. Among those who thanked Reney for his three decades of service, which include countless lectures, a popular blog, as well as commentaries and film screenings, were Congressman Richard Neal and Massachusetts state representative Steve Kulik, as well as Mayor Sarno. All three professed to be fans of Reney, each making knowledgeable reference to various experiences or anecdotes of their listening times (the politicians often returning home after late working sessions). The City of Springfield declared November 16th “Tom Reney Day;” the Commonwealth of Massachusetts also acknowledged his legendary standing in the broadcasting community; and, Rep. Neal inserted his acknowledgement into the Congressional Record, giving it national, and permanent, stature. (Click title to access form) We are setting up a directory of jazz musicians and bands who perform in the Berkshires. Please submit this form if you would like to be included. Jazz musicians who live and/or perform in the greater Berkshires are invited to be listed in our directory: please see this page: jazz musicians in the Berkshires. Peter Putnam palys with The Wanda Houston Band, The Putnam Bros., Jeff Stevens, and Rob Kelly. I’ve played in a lot of bands, some pretty darn good, some God awful. The Pittsfield Sister City Jazz Ambassadors have concluded another successful season of bringing jazz into the schools of Berkshire County. An embodiment of our ongoing commitment to jazz education, these visits comprise performances, discussion, demonstrations, and even jamming with the students. As documented herein, the Ambassadors bring an unforgettable experience to the schools. The musicians included Andy Kelly, leader (guitar, banjo, vocals, docent); Charlie Tokarz (woodwinds); Matt Cusson (piano, vocals); James Lumsden (bass); Jon Haddad (percussion). Mount Everett Regional High School, Sheffield. We did a seminar with the school’s jazz ensemble at 7:30 in the morning, which is their rehearsal time! (Too early for musicians, some might say). The young musicians got a lot out of it, and several came to jam with us at our performance, later in the morning. Here is a clip of us practicing with the students. Abbott Memorial School, Florida, MA. Kindergarden through 8th grade. We played for the entire school in an underground cement gymnasium. They were dancing to the music. The band was interviewed by the school newspaper, and each class wanted to have their pictures taken with the band. They left the show loving jazz music! New Marlboro Central School. pre K through 6th grade. Marvelous show. High energy. The kids all left feeling like jazz enthusiasts. The young teachers wanted dates with (pianist) Matt Cusson! Lee Elementary School. The students were the most excited here! The teachers and administrators said that it was their best assembly, EVER! Farmington River Elementary, Otis. These students don’t get much cultural enrichment, so, they cherished having live music to dance to, to learn the history of jazz, and how jazz works. Morris Elementary, Lenox. They sent about 200 students to the show. As teachers were passing by in the hall, they were asking, “why didn’t our class get to come and see this great show, too?” That was the principal’s call. He really wants us back so he can have all of the students get to see the program. Huge success! Clarksburg Elementary and Middle School, in this faraway northwest corner of the state. In addition to the music, we got to answer some great questions about jazz from. The show was lively, and the entire school attended. We had about 1,700 spectators at the shows this fall. That would include 1,500 students and 200 parents, PTO members, teachers, and administrators. Thank you for the opportunity to offer these performances, and to introduce our young people to jazz music. It is a true gift that they are receiving! The school administrations thanked the Jazz Festival Committee, our sponsors, and the Sister City Jazz Ambassadors profusely! The schools reacted positively to the Pittsfield Sister City Jazz Ambassadors’ outreach in 2011, part of the extended activities of the Pittsfield CityJazz Festival. Here are some of their responses. Our involvement with the community extends beyond the popular concerts that we present. One of the key elements of the Pittsfield CityJazz Festival are Jazz in the Schools, which last year sent the Pittsfield Sister City Jazz Ambassadors to Lee Middle and High Schools, Kittredge Elementary School (Hinsdale), Becket/Washington Elementary School (Becket), Greylock Elementary School (North Adams), Sullivan Elementary School (North Adams), Mt. Greylock Regional High School (Williamstown), Brayton Elementary School (North Adams) where they gave lessons on jazz history and the fundamentals of jazz music. 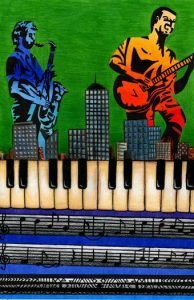 Another program associated with the Festival is the annual Student Art Contest, which this year attracted entries from 123 students from Pittsfield High School, Taconic High School, St. Joseph’s and Miss Hall’s. The winning entry is used as the primary graphic element of that year’s Festival marketing effort. At last year’s awards ceremony, another important part of our mission, the BerkshiresJazz Youth Ensemble entertained their peers and guests at the Berkshire Museum.